Fans of Abbas Kiarostami who have been wondering when they'll be able to see Five (2003)—his 74-minute, five- part experimental film without dialogue, all shot on the seashore while he was scripting Jafar Panahi's Crimson Gold—should know that it's recently come out in France on a well-produced DVD released by MK2 and readily available from French Amazon for just under 28 Euros. (Like other overseas DVDs, it's playable on any multiregional DVD player, which includes a surprising number of stateside computers.) Apparently part of the reason for the long delay was Kiarostami's slowness in producing a "making of" documentary, though what he's finally come up with—his hour-long About Five, completed in late 2005, available with English subtitles on the same DVD—is quite fascinating. Responding to pertinent questions put to him by English critic and programmer Geoff Andrew, he views his own work with a lot of refreshing as well as helpful candor. Much as the French DVD of The Wind Will Carry Us, also released by MK2 (and somewhat cheaper, even though it's a two-disc set), includes a couple of mind-boggling Japanese documentaries (also with English subtitles) that have done much to enhance my appreciation of one of Kiarostami's greatest films, his own account of his more modest Five is no less full of surprising revelations about the elaborate artifice that lurks behind most of his seeming causalness and off-handed methods as a filmmaker. And his remarks about what he regards as ideal viewers and viewing situations may also raise a few eyebrows. Not only does he approve of viewers falling asleep while watching Five and say so without the slightest trace of irony, he also recommends comfortable armchairs. So a DVD player at home with good speakers and a reasonable-sized screen is a much more ideal setting than any art museum—which is lamentably where this film has mainly been shown, when it's been showing at all. It still hasn't surfaced in Chicago in any form. But now it's accessible to anyone who bothers to order it, as I just did. And I hasten to add that under the right conditions, it's an immensely pleasurable experience, even if one stays awake. I actually prefer it to his 10--and About Five is better than his Ten on 10. President Bush's one big bipartisan legislative accomplishment will be up for reauthorization in 2007. Alexander Russo at This Week in Education sees an "unholy alliance" between liberal critics of No Child Left Behind such as Gerald Bracey and conservative critics such as Checker Finn. Andrew Rotherham at Eduwonk.com offers an "NCLB Tip Sheet" giving the odds on possible outcomes of the debate. Neither Bracey nor Finn will be pleased. The best odds are on "no reauthorization until after the 2008 election." And it's 35-1 against "National Education Association reasserts itself and rewrites the law to its liking." It should be a boom year for education pundits, dueling researchers, heart-rending stories, and the like. How would you change the law, if at all? Earlier this year a reader interpreted something I wrote as a slight against the food in our mutual hometown, Pittsburgh, PA. I'm sorry she saw it that way, because I'll readily admit to yinz that the midsize, depopulating, rust belt 'Burgh ain't a bad place to eat. I mean, there isn't a hot dog in Chicago that can touch the charred, natural casing wieners at The Dirty O. It's the ancestral home of the Clark Bar, Heinz Ketchup, and Klondikes. 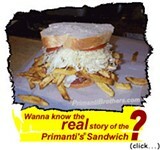 A jumbo and cheese sandwich from Primanti Brothers, heaped with fries and coleslaw, is a marvelous thing. And who can't admire the sheer audacity of the pierogie [sic] pizza? The culinary epicenter of my oft-maligned city is the Strip District, a half-square-mile neighborhood on the flood plain of the Allegheny River. A onetime steel-producing center (like, where wasn't?) and later a nucleus of the wholesale produce business, it's now a cross between Maxwell Street and the gentrified meatpacking district, a destination for tourists and townies alike. Saturday mornings in the Strip are a mob scene as people crowd the diners, file into amazing Old World delis, or line up for streetside-fried Korean mung bean pancakes. The day before Christmas Eve I got trapped in Wholey's, as practically every Catholic in the tristate area was making a seafood run for the Feast of Seven Fishes. I'm currently obsessed with Parma Sausage Products, a 52-year-old pork emporium that cures its own prosciutto and a gorgeous line of sausages. The retail potential of the Strip has even attracted outsiders like Penzey's, though the spice shop's bougie atmosphere seems a little out of place in one of the most unpretentious neighborhoods in a thoroughly unpretentious city. So if some jag off ever tries to tell you the 'Burgh is a hopeless backwater with nothing to eat, you can tell him I says gitdahellaht! "The technology of ink on paper is highly advanced," writes Joseph Rago, assistant assistant editorial features editor at the Wall Street Journal at Opinion Journal, "and has over centuries accumulated a major institutional culture that screens editorially for originality, expertise and seriousness." Blog journalism, on the other hand, "appears to be a change for the worse. That is, the inferiority of the medium is rooted in its new, distinctive literary form.... Instant response, with not even a day of delay, impairs rigor. It is also a coagulant for orthodoxies. We rarely encounter sustained or systematic blog thought -- instead, panics and manias; endless rehearsings of arguments put forward elsewhere; and a tendency to substitute ideology for cognition." Overgeneralized twaddle like this is nothing new, and substituting ideology for cognition is what most people do most of the time in any medium available. But it's especially instructive to hear it from a publication that has just published ten articles on "Poverty: The Search for New Solutions", in which race is mentioned, very briefly, just twice. 31) My Brightest Diamond Bring Me the Workhorse (Asthmatic Kitty) I would’ve never guessed that a back-up singer for Sufjan Stevens could be such a force of nature on her own, but New Yorker Shara Worden struck gold, setting her studied, elegant singing against churning rock grooves and producing one of the most emotionally potent and sophisticated rock albums of the year. 32) Jazzkammer Metal Music Machine (Smalltown Superjazz) The Norwegian noise duo of Lasse Marhaug and John Hegre have markedly moved away from brutality in recent years, but here they jump face first into the gaping maw of black metal, working with members of Enslaved and Manngard to reduce the genre to its most elemental building blocks. 33) Tyft Meg Nem Sa (Skirl) This trio led by the Icelandic guitarist Hilmar Jensson eagerly blurs lines between noise rock, prog, and jazz with intricately arranged miniatures packed with abrasive melodies and dynamic arrangements that play with scale, texture, and rhythm. 34) Scott Walker The Drift (4AD) The most difficult album I heard all year, but one of the most rewarding, too. Walker has a very dark view of the world and his ominous compositions reflect it: clashing harmonies, ultra-thick arrangements, and his trademark lugubrious croon. 35) Donny McCaslin Soar (Sunnyside) This has been a great year for saxophonist Donny McCaslin. He’s become a key presence in the Dave Douglas Quintet and he released his best album as a leader, forging a bracing intersection of post-bop improvisation and masterfully integrated Latin American rhythmic material. 36) Jason Collett Idols of Exile (Arts & Crafts) The guitarist for Toronto’s much ballyhooed Broken Social Scene makes a solo record that lives up to the fuss; ultra-hooky, funny, and oddly tender. 37) Bunky Green Another Place (Label Bleu) The veteran alto saxophonist sounds as hungry as a man half his age, prodded by a superb rhythm section that includes the wonderful pianist Jason Moran. 38) The Source The Source (ECM) This Norwegian quartet situates gorgeously lyric solos within austere compositions—most by the fantastic trombonist Øyvind Brække—to an almost insidious effect. You can miss the beauty of these slow-moving gems if you don’t listen carefully. 39) Juana Molina Son (Domino) On her best album yet the gentle Argentinean singer gives her music a deeply appealing homemade quality, as spare acoustic guitar patterns, eerie analog synth, and inventively manipulated samples of her own whistling, beatboxing, and scatting all coalesce together in the most natural way. 40) Omer Avital The Ancient Art of Giving (Smalls) Gorgeous tunes, a killer band—including tenor saxophonist Mark Turner, drummer Ali Jackson, and trumpeter Avishai Cohen—and fierce arrangements make this new quintet album by the Israeli born bassist one of the most convincing post-bop outings in years. Consider supplementing New Year's Eve's mostly uninspiring offerings with these two upcoming benefit concerts for Jackson Presley Diamond, a three-year-old boy who has been severely disabled since shortly after a round of routine vaccinations at 18 months. You may recall that the Reader ran a cover story (pdf) on the possibility that his condition was a rare reaction to the vaccine for whooping cough. Considering his and his family's horrific bad luck, there is one spot of good fortune in little Jackson's story: his father is Lee Diamond, drummer for the Douglass Kings and Replica Republic, and his family isn't hurting for helpful and talented friends. These two shows, December 29 and 30 at Beat Kitchen and Subterranean, will feature the Vandermark 5, Dianogah, Nad Navillus, the Dave Rempis Percussion Quartet, Telenovela, and many others, as well as both of Mr. Diamond's own bands (one on each night). Five local poster artists will also be selling limited-edition designs. Proceeds go to Easter Seals, the National Childhood Vaccine Information Center, and Physicians For a National Health Program as well as the Jackson Presley Diamond Fund. Tickets are only $10 for each night or $15 for both nights and can be purchased on line through the club's Web sites. The Roberta-Flack-via-Dirty-South synth line that opens T.I. 's "What You Know" was as big a gimme as any DJ could ask for this year -- dropping it at any time of night got a reaction from the crowd equivalent to throwing a handful of twenties on the dancefloor. Nothing else on King (Atlantic) was anywhere near that bonkers, but Tip's at the forefront -- alongside Nas, Lupe, and the Clipse -- of the best hip-hop trend in forever: making records you can actually sit all the way through in one listen. The biggest reason OOIOO's Taiga (Thrill Jockey) wasn't my most-istened-to album this year is that it sat on my desk for too long before I actually listened to it. The ideas Yoshimi and her gang kick out had always sounded better in concept than in practice. But hearing them arrange these psychedelic textures -- from tribal pounding to mellow mindstorms that beg for the "groovy"descriptor -- into a near-perfect whole now has me completely freaked. What if I got it wrong before and I've been missing out on one of the best bands going? I'm fully against the concept of "guilty pleasures" -- either you like something or you don't -- but I'm still sort of embarrassed about where the Sounds' Dying to Say This to You (New Line) stands in my iTunes rankings. It's everything its critics complain about -- a vapid sugar rush of an album -- but it's also got to have the hook-densest record I've heard this year. Deep inside my mind there's a voice warning me about the long-term effects of ingesting this much candyfloss, but it's drowned out by the chorus that's chanting, "More, more, more!" This past year brought a deluge of psych rock -- from Brightblack Morning Light's chill-out teepee sounds to the slowly riffing doom metal invasion -- but its high-water mark may have been Comets on Fire's Avatar (Sub Pop). The decision to apply their expert soundscaping abilities within stricter song structures was unexpectedly brilliant. A batch of lysergic rippers to make your stoner uncle weep with joy. The Hold Steady's Boys and Girls in America (Vagrant) almost drowned under the waves of commentary, meta-commentary, and meta-meta-commentary that followed its release. My two cents: if you judged records solely on the quality of the air-guitaring they inspire, this might be the decade's greatest album so far. This morning the dailies reported that supporters of William "Dock" Walls have challenged the ballot petitions submitted by Mayor Daley’s campaign. Walls and his backers charge that forgeries and the names of unregistered voters were illegally included among the 24,000-plus signatures the Daley campaign submitted to the Board of Election Commissioners for the City of Chicago. “I don’t expect Daley to stay on the ballot,” Walls proclaimed to the Sun-Times. But since only 12,500 signatures are needed to run for mayor, the Walls team will have to show that nearly half of the Daley signatures don’t count. As followers of local politics know, the petition challenge process is part of the election cycle in Chicago. This time, challenges have been filed in 40 of the 50 races (47 of 50 aldermen have opponents, as do the mayor, city clerk, and city treasurer). Ballot challenges are a big reason that it’s hard for opponents to compete against incumbents in municipal elections. Combing through the signatures on ballot petitions takes lots of time and, if done comprehensively, lots of people. And incumbents generally have more experienced and motivated volunteers to mobilize for the challenge work, since they can turn to their own staffs, families, and others whose employment future may depend on a successful reelection effort. Call it friends helping friends or call it patronage, but of the 93 people who filed petition challenges by yesterday’s deadline, 21 had names that also appear on the city payroll, including nine people listed as staffers for aldermen or City Council committees. Not one of the city workers was involved in a challenge to a sitting official. Interestingly, one of the city workers is a guy named Ricardo Munoz, who's challenged the petitions of Raul Molina, the lone opponent to 33rd Ward fixture Richard Mell, a longtime machine guy and Daley loyalist. Current 22nd Ward alderman Ricardo Munoz said it’s not him. “There are eight Ricardo Munozes registered to vote in the city of Chicago, and my son makes nine of us,” the alderman said. Four of them, including the alderman and his son, live within a few blocks of 30th and Lawndale. "One of the others is a precinct captain in the 33rd Ward, and it's caused me all kinds of trouble because he's also a city worker," the alderman said. The petition-challenging Ricardo Munoz works in the city’s water department and, the alderman says with some exasperation, is twice his size. On the opponents' side, Richard Barnett, a west-side activist who was a key member of the Harold Washington campaigns, filed challenges against mayoral longshots Syron M. Smith and Ziff Anthony Sistrunk. Barnett is reportedly working for Dorothy Brown—not Walls, who likes to remind people that he was a Washington aide. 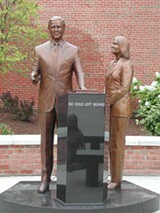 At the Stranger's Slog Paul Constant says what needs to be said, blaming Rumsfeld and Cheney on the Unelected One (pictured), though commenters beg to differ. Chris Floyd at Empire Burlesque recalls his ugly role in the East Timor invasion. On the plus side, Pam Spaulding at Pandagon credits him for opposing antigay bigotry. Let me know if you see any MSM obituary that does so -- or contrasts him as forcefully with the Reagan thuggery as does Juan Cole (in the next-to-last paragraph of a very long post; see also the vigorous comments). On a lighter note, Beachwood Reporter collects one-liners on Gerald Ford and James Brown, not exactly to Ford's credit. And Jesse Walker at Reason's Hit & Run recalls that Brown actually commented on Ford, more kindly than anyone else I'm willing to link to. In his recent Nation essay 9/11: The Roots of Paranoia, sometime Reader contributor Christopher Hayes offers an enlightening take on the gullibility of Americans. According to a Scripps public opinion poll, "one-third of Americans think that the government either carried out the 9/11 attacks or intentionally allowed them to happen," but Hayes notes that life pretty much "continues as before, even though tens of millions of people apparently believe they are being governed by mass murderers." Hayes explains that "the credulous style can brook no acknowledgement of unarticulated motives to our political actors, or consultations to which the public is not privy." The more I think about Hayes's theory -- which he juxtaposes with historian Richard Hofstadter's famous essay on the paranoid style in American politics -- the more I realize how well it works for Chicago. I can't tell you how many critics of the Daley administration have begged me not to print their names for fear they will lose their jobs or basic services or become the target of city inspectors. Yet many of these same people seem surprisingly content to live in a city about which they fear the very worst. Most of them tell me they plan to vote for Mayor Daley. "In the credulous style, all political actors are acting with good intentions and good faith," Hayes writes. "Mistakes are made, but never because of ulterior motives or undue influences from the various locii of corporate power. When people in power advocate strenuously for a position it is because they believe in it. When their advocacy leads to policies that create misery, it is due not to any evil intentions or greed or corruption, but rather simple human error." Think about it: Mayor Daley was shocked to read in the newspapers about the patronage abuses of his top aides -- not to mention the hired truck scandal, the Duff minority hiring scandal, and every other other scandal of the last few years. Property taxes? They're not going up -- the mayor said as much in his budget speech. Tax increment financing districts? They don't take money from the schools, they give money to the schools, just like the mayor said. The list goes on and on.